Cooking, Cronk, and Two Crazy Dogs: Spatchcock a Chicken? Should I Take it to Dinner First? Spatchcock a Chicken? Should I Take it to Dinner First? Sometimes you run into a recipe that requires you to do something you normally wouldn't or presents you with a term you haven't heard before. Example - a recipe that I made for dinner tonight requires you to "spatchcock" a whole chicken. While this may sound a little unusual, or possibly dangerous, it's pretty easy to do. 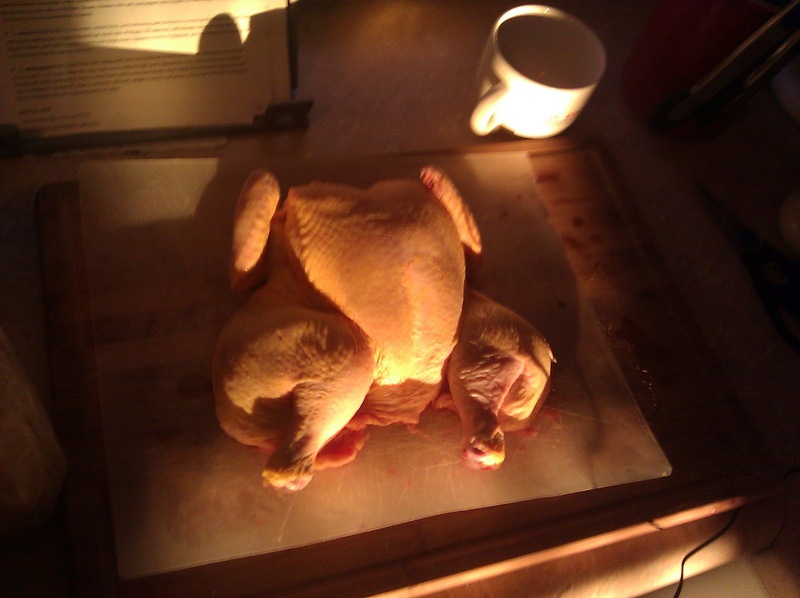 A plastic cutting board (the germy chicken juices won't get absorbed by it). A sharp pair of kitchen shears - you can use a sharp chef's knife, but it's much safer with shears. Place the chicken breast side down on the cutting board. Pat the chicken dry with paper towels. 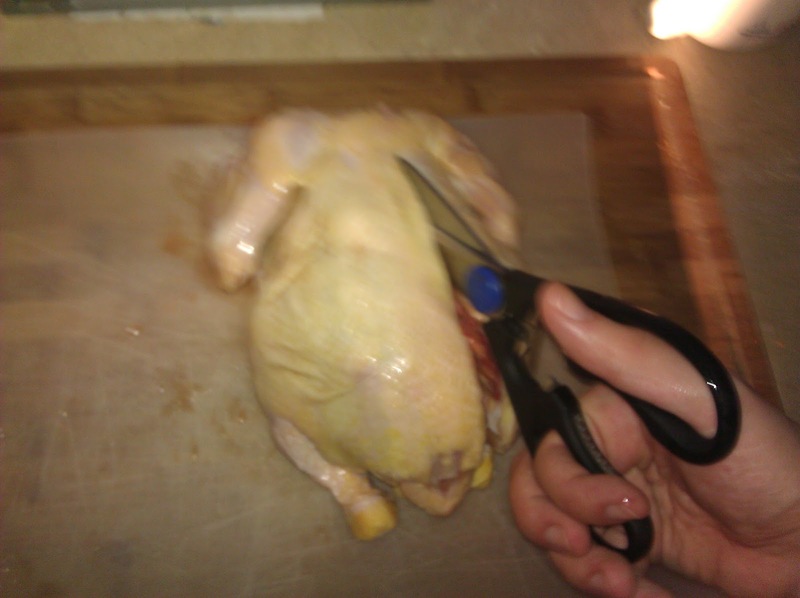 The less moisture, the less chance that the chicken will slide around when you're cutting it. Using the kitchen shears, carefully cut along one side of the backbone until you've cut all the way through. Repeat cutting along the other side of the backbone. Remove it, but don't toss it! Freeze it so you have it on hand the next time you're making chicken stock. You are making your own stock, right? Flip the chicken over so it's breast side up. 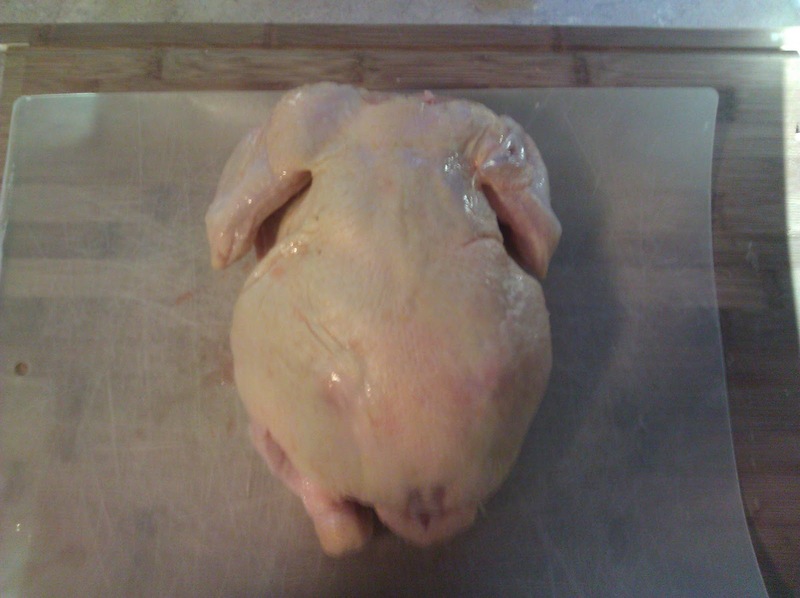 Press down hard on the middle of the breastbone until you hear it pop, and the chicken lays flatter. This is also a great way to relieve stress. The sun was coming in through my windows when I took the picture for this step. I think it makes the chicken look very dramatic :). Place the chicken in the cooking vessel that your recipe requires. Clean everything! Wash your knife, cutting board, counter and hands. Now that you've prepped a great chicken, you don't want to spend hours in the bathroom with salmonella. 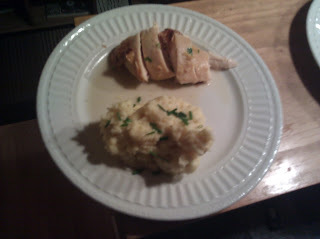 I used my spatchcocked chicken to make Roast Lemon Chicken. It came out great. this makes roasting or baking a whole bird so much easier.I followed you from the foodie blog roll and I'd love to guide Foodista readers to your site. I hope you could add this spatchcocking widget at the end of this post so we could add you in our list of food bloggers who blogged about how to spatchcock a chicken,Thanks!